EXTRA: Shannon Smith exhibits her color photos, Doing It Domestic, a series picturing her young family, in the pop-up gallery through April 20. EXTRA: Artist Chris Rush launches his first book, The Light Years, at 3 p.m. Saturday, April 13, in the gallery. Rush, a Tucson visual artist, will do a free book reading and signing of his memoir in an event co-sponsored by Antigone Books. See excerpt on page 10. The town was out in the boonies, 58 miles east of San Francisco, but tract houses were going up as fast as anyone could build them—and people were racing just as fast to move in. These new residents were pioneers who'd fled the city to tame the former countryside, cul de sac by cul de sac. To Owens, not only was it light years away from life in Jamaica, this new society wasn't anything like America had seen before. It even had a name: suburbia. These buoyant black-and-white images, immortalized in the 1973 book Suburbia, were not entirely the work of a detached anthropologist investigating an exotic civilization. Owens and his wife were shocked at first by their new surroundings but it didn't take them long "to catch up with the suburban lifestyle," he told reporter Kate Abbott years later. "That American dream—two cars and a fridge full of food—is a way of life emulated by people all over the world." One attendee at the boozy Christmas party told him "We really enjoy getting together to drink and dance. It's a wild party and we're having a great time." More sedately, out at the barbecue in high summer, an informant wielding a spatula reported, "Sunday afternoon we get it together. I cook the steaks, and my wife makes the salad." Interestingly, in a "work plan" Owens wrote in the late '60s or early '70s, he took note that his pictures, of optimistic young families settling in what they saw as a brave new world, were out of step with the turbulent times, when other photographers were documenting "minorities...violence and social breakdown." But Owens was prescient enough to see the problems that would erupt in these communities. The rapidly growing suburbs were already disrupting small rural towns and straining local resources. And he was already seeing the "entrenchment of the white middle class"—only one photo of the tidy new Livermore features a person of color: a man weighted down by the trash can on his back. He also predicted the "phenomenon of isolation" in these remote commuter towns that relied heavily on cars. 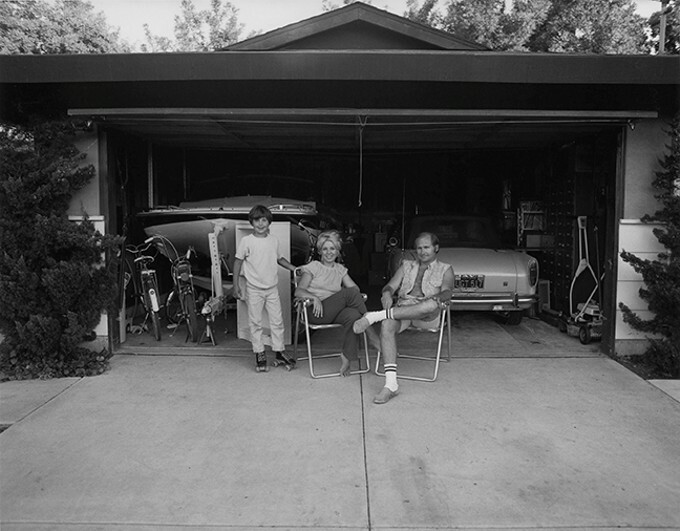 The family sitting in the garage told him, "Our house is built with the living room on the back, so in the evenings we sit out front of the garage and watch the traffic go by." Inadvertently, the family was describing what turned out to be an architectural failing of suburbia's new tract houses. The garage out front replaced the friendly front porch of older times; these developments prized the automobile over community. Their subjects range from transplanted retirees at play to fading rituals of the Old West. In 1979's "Afternoon Stroll," a dapper elder in white rides his bicycle past a ranch home with architectural roots in California. In "Sun City early morning" from 1980, elders exercise outdoors in a clipped palm tree paradise. But that same year, "Last wild horse round-up, Bullhead City," records a trio of cowpokes in 10-gallon hats who've wrestled a horse to the ground. Hurn also keeps an eye on the galloping development laying waste to the pristine desert. Highways cut through the cacti in his pictures, and in one shot beleaguered environmentalists have posted a banner that reads "Save Our Desert." Graham travels all across the nation, making what he calls "cultural landscape" photos. Colored in cheery, pungent palette, his images picture a giant black-and-white cow sculpture planted in dairy-rich Wisconsin, a pink neon-lit motel in New Mexico and a kids' football team practicing beneath a statue of a golden ear of corn in Minneapolis. He hits California too. An orange sign at the edge of a dead-dry pasture announces "Really Really Good," and a yellow billboard rising up alongside a new highway wishes the harried road traveler "Good Luck." Back home in Philadelphia—my hometown!—he has a shot of a contemporary building adorned with wonderful trompe l'oeil murals of local heroes William Penn and Benjamin Franklin. And down the shore in Wildwood, N.J.—sin city to Philadelphia teens—he's made a lively near-abstraction of a beach hotel. Newly gussied up by a fresh coat of crayon colors, the hotel is a mid-century modern affair, birthed by an architectural impulse that reached from sea to shining sea, from the Jersey Shore to the California 'burbs.